A court in Moscow has ordered opposition leader Alexei Navalny to take down his second video investigation in two years. 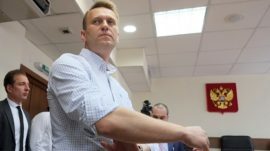 “The court satisfied the ‘Druzhba Narodov LLC’ meat processing plant’s protection of business reputation claim against Navalny,” Moscow’s arbitration court told Interfax on Tuesday. An Anti-Corruption Foundation lawyer said they planned to appeal the court decision. Last month, a Moscow court rejected National Guard director Viktor Zolotov’s slander lawsuit against Navalny in connection with the same procurement contract investigation. Previously in 2017, Navalny’s foundation complied with a court order to remove excerpts of a video investigation accusing Prime Minister Dmitry Medvedev and billionaire Alisher Usmanov of corruption.